Will Browning accidentally creates a clone of himself when working on a science project. Charlie Boyle finds that even his high IQ can't solve all of his problems when he takes on a double life in order to make friends his own age. A white South African girl finds herself in a difficult situation when she is sent to spend a term with a black family in America. A girl steals a weather machine from Santa Claus, to make a snow day. The machine breaks, and causes an out-of-control snowstorm. The only normal member of a super-powered family feels left out and confused until he has the chance to use a talent of his own to save everyone. After treating his rancher cousin shoddily in L.A. Michael Woods is sentenced by his parents to spending a month on the ranch with his cousin and aunt. A teen enlists the help of an imaginary friend named Larry Houdini to deal with a prank-playing bogeyman, who's framing her for his dastardly deeds. I have seen nearly all the Disney Channel Original Movies, and this one has to be my favorite! 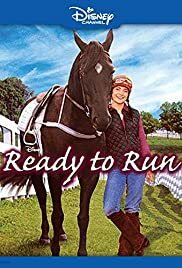 Good acting, great music, and the element of animals all combine, turning "Ready to Run" into a great movie for people of all ages! In short, this movie may not have a star-studded cast, but it more than makes up for it in quality.